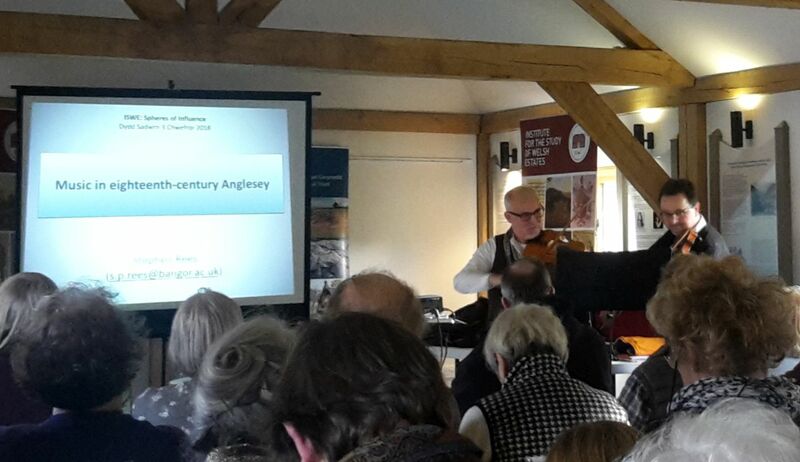 Yesterday’s ‘Spheres of Influence’ day-conference at Plas Cadnant had a wide ranging cast of characters: the prominent medieval founder of many of Anglesey’s landowning families, the incomer who took on the indigenous families, the bards and musicians who praised and entertained the gentry, the Spanish Armada, and even a very fluffy cat. Also included were tales of feuds and murders, but also of good deeds by social reformers. Organised by the Institute for the Study of Welsh Estates (ISWE) at Bangor University, the Gwynedd Archaeological Trust, and the Anglesey Antiquarian Society, the conference aimed to explore the impacts of the estates of Anglesey on the history, culture and landscapes of the island, from the medieval period to the present day. Very well attended, with a packed house of well over 100 history enthusiasts, it was an enjoyable and interesting day. The day kicked off with a brief welcome from Shaun Evans of the ISWE, who introduced the first speaker, Prof. A.D. Carr. The esteemed author of the book Medieval Anglesey, the definitive study of the society and communities of Anglesey in the Middle Ages, Prof. Carr spoke on “The emergence of the gentry and estates of Anglesey in the later middle ages”. He began by pointing out that the early emergence of the estates on Anglesey was well documented through the Extents of Anglesey in 1284 and 1352. These documents recorded all the landowners on the island and how much was owed to them by their tenants, either in money or in goods such as grain, fish and hens, or time working for the lord. The 1284 extent was produced immediately after Edward I’s conquest of Wales and shows the land ownership patterns that existed during the Welsh Princes’ time. The more extensive and detailed Extent of 1352 can then be compared to the earlier one to see how land ownership patterns had changed through the decades. During this time Welsh law decreed that inherited lands couldn’t be sold; they had to remain in the family. However, post-Conquest, clever ways were found around these rules, so the more ambitious landowners began accumulating larger estates, either through the land market or through marriage. Prof. Carr described the development of two estates, Penrhyn and Bulkeley. Although we now know the Penrhyn estate as the one outside Bangor, the family estate was first developed by Gwilym ap Gruffudd, a descendent of the founder of one of the first hereditary estates on Anglesey, Ednyfed Fychan (seneschal to the Prince of Wales, Llewelyn ap Iorwerth), through acquisition of lands in the northeast of Anglesey. His descendants, now known as the Griffith family, crossed the strait to develop the current Penrhyn estate. The development of the estate is well documented through extensive estate papers now held by Bangor University Archives. The second example Prof. Carr gave was the development of the Bulkeley estate. The family were incomers, originating from near Cheadle in Cheshire. William Bulkeley arrived in Anglesey in the 15th century and married another descendent of Ednyfed Fychan. They first settled in the town house of Henblas in Beaumaris (which has now disappeared, but once stood near the church), but soon set about acquiring land in the area. Archives hold at least 45 deeds showing land purchases by Bulkeley between 1450 and 1490. The next speaker was Prof. Robin Grove-White, speaking on “Politics and precedence: Power struggles and estate owners in late-Tudor Anglesey”. He began his talk with the shadow of the Spanish Armada hovering over Anglesey. In 1588 no one knew where the Spanish were planning on invading, so an edict went out to all coastal communities to prepare defences and imprison any possible collaborators. Richard Bulkeley, who had good connections with the Royal Court, was appointed deputy lieutenant of the island in charge of these defences. However, he was accused of using his position to favour his friends and punish his enemies. Feuds broke out with other Anglesey landowners, particularly Sir William Owen of Bodeon, near Bodorgan. The feud led to both men being imprisoned at different times, and with Bulkeley even being accused of murder. The feud was more or less over by 1590, with Bulkeley emerging as one of the most powerful men on the island. Of course struggles for power are part of the human condition, not just restricted to 16th century Anglesey, and Prof. Grove-White gave other examples of political wrangles through the ages. After a few questions to the first two speakers, the doors opened for the first coffee break. In walked the next character, the very fluffy Plas Cadnant cat, who wandered around the room making sure everyone was welcome. After the break Andrew Davidson from the Gwynedd Archaeological Trust spoke about church architecture and patronage of the local land owners. He noted that there was a hiatus in the building or extension of churches in northwest Wales during the late 13th and 14th centuries. This can be attributed to the turmoils of the Edwardian conquest of North Wales, the plague years, and the Glyndŵr revolt. After these were over, the political stability allowed the estate owners to look towards using their patronage to build and enhance the churches on their lands. Davidson gave many examples of churches in the area, particularly focusing on the development of Gothic style windows with tracery and trefoils, allowing much more light into the church. He also described some low relief slabs with images of saints, and the rare alabaster tombs such as the Gronw Fychan tomb at St. Gredifael church, Penmynydd, with stylistic elements that indicate the patronage of the local lords. Next up was Richard Suggett of the Royal Commission on the Ancient and Historical Monuments of Wales. Entitled “From Hafoty to Plas Coch: Anglesey’s Plastai”, he took us on a tour of his favourite country manor homes on Anglesey among the many he has visited through his career. He started off noting that, while Ireland is well known among country house enthusiasts for its fine manor houses, Anglesey is its equal for the quality and variety. “Why go to Ireland when you can go to Anglesey?” he quoted as the feeling among many of his colleagues. His tour started with Plas Llanidan, which he visited in the 1980s when it was encased in scaffolding and being repaired, through Trefadog, Hafoty, the Tudor Rose shop and Henblas town house (now demolished) in Beaumaris, Gronant, Plas Coch, Henblas in Llangristiolus and Baron Hill. Our kind host at Plas Cadnant, Anthony Tavernor, gave us a talk about the history of his house and estate. Originally a dairy farmer in the English midlands, his interests in history, gardens and landscapes led him to use the proceeds of a land sale to purchase the Plas Cadnant estate. The estate was founded in the 18th century by John Price, originally of Wern Farm, who was a land agent for the Marquess of Anglesey. His marriage to a local heiress and subsequent land purchases allowed him to develop the estate. His admiration of the work of the landscape designer Humphry Repton led him to begin laying out the grand landscape and gardens of the estate, which was continued by his descendants. The last Price died in 1928 and the estate was bought by the Fanning-Evans family. They modernised the house with electricity and central heating, but the family was often not there, and it was rented out. The estate declined and eventually was sold in 1993, with the new owner planning on developing an equestrian centre. However, these plans (which included demolishing many of the outbuildings) never came to fruition, and in 1996 it was sold to Tavernor. He took us on a photographic tour of his journey of clearing the overgrown walled garden and rescuing the outbuildings buried deep in the surrounding vegetation, creating the beautiful gardens and woodland walks that we can now enjoy. After lunch Ann Parry Owen, of the Centre for Advanced Welsh & Celtic Studies in Aberystwyth, talked to us about “Guto’r Glyn (c.1412-93) and bardic patronage in Anglesey”. The tradition of bardic poetry praising the patrons of the bards thrived in the 12th through 15th centuries. Owen pointed out that in England estate owners would display maps of their estates on the wall to impress their visitors, but in Wales the lords would have their bards recite their verses describing the estate. By the 15th century the bards would also be praising the quality of the food on their patrons’ tables and describing their impressive furniture and decorations in detail. She then went on to talk about the great bard Guto’r Glyn, who travelled all over Wales, but particularly wrote warmly about Anglesey, and spent much time here. She also gave us a tour of the gutorglyn.net web site that she and her colleagues have put together, which brings together all his poems, their translations, and other details about his work and life. A musical interlude followed as Stephen Rees, of the ISWE in Bangor, was joined by Huw Roberts, both with fiddles, to play a song that was found in the journals of Richard Morris, one of the famous 18th century Morris brothers of Anglesey. In between performing some other 18th century songs, Rees described how many old Welsh folk tunes were preserved in manuscripts of the time. Richard Morris recorded the words of many songs, but the famous diarist William Bulkeley of Brynddu, a great music enthusiast, also recorded the tunes, as shown in the page shown here from Bangor University’s website of his diaries. However, the greatest source of 18th century folk tunes is the manuscript by Morris Edwards, which contained a large number of variations on old tunes, oral tradition and dance tunes of the time, and some songs that are very likely to be his own compositions. Little is known of him, but his manuscript preserves a great tradition of Welsh folks tunes. Dinah Evans, of the Bangor University history department, next took the stage to tell us about “Cecilia Constance Irby, Lady Boston”. Evans has been interested in looking at the experiences of women in Wales from various social classes during World War I. One aristocratic woman with an interesting story and an Anglesey connection was Cecilia Constance Irby. She married George Florance Irby, 6th Baron Boston, who had an Anglesey seat at Plas Lligwy, near Moelfre. Evans discovered that during the war Cecilia was working as a nurse for the Canadian Red Cross military hospital on the Astor family’s Clivedon estate in Buckinghamshire. Digging into her life further, she discovered an upper class woman who showed great concern for the plight of the working classes, and was involved in many philanthropic organizations, such as the Welsh Industries Committee, which aimed to develop industries in Wales to provide work for Welsh workers who otherwise might head to the big cities in England. She also wrote a prize-winning essay for the Anglesey Eisteddfod titled “Anglesey Industries”, an extensive and well researched academic work describing all aspects of the island, including agriculture, geology and natural resources. To round off the day, George Meyrick, owner of the Bodorgan estate and new chancellor of Bangor University, gave us a unique insight on “Inheriting Bodorgan: the influences of the past on the present”. He spoke of the long history of the family and estate, and of the many tasks the current owner/custodian of the land had, such as managing the estate and agricultural holdings, attending to property ownership and access rights issues, and pursuing new ventures to ensure the survival of the estate. He noted that many of the Welsh gentry are “now nearly extinct”, so as one of the remaining estate owning families he is pursuing a strategy of diversifying the estate and looking after its natural environment.